Our love for BBQ began in the home of the Liberty Bell. While most of our neighbors were deciding whether to get their Philly Cheesesteak with onions or Cheez Wiz, we were learning to slow cook meats on our $28 water smoker. BBQ falls into two categories...meats you can put on a roll (sandwich meats) and those you can't without breaking a tooth (bone in meats like ribs and whole chickens). 72 Hours notice required for all orders. Call us if you have a small, last minute (24-72 hr notice) order and we may be able to accommodate. Orders may be cancelled up to 72 hours before event. For cancellations or changes within 72 hours, customer may be responsible for up to 100% of order price. Prices are for drop-off catering and do not include tax or delivery fee of 10% (not to exceed $75) Set-up and attendants are available, call for quote. Prices subject to change. See website for current pricing. 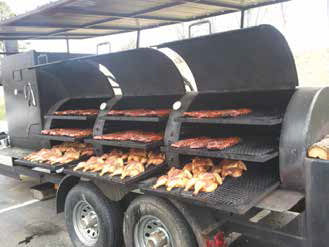 We'll bring our smoker on site!